The Quicken Trust is taking a holistic approach to transforming the Ugandan village of Kabubbu which has suffered decades of destitution and disease. The charity is focusing on meeting the spiritual needs of the people as well as their physical needs. Quicken has also shown inspirational films to the local community using equipment funded by the Spring Harvest Charitable Trust. Often more than 200 people turn up to watch. The Church with No Name! In 2007 Quicken and the Kabubbu Development Project set up a new church which meets at the Trust High School, the Kabubbu Community Church. 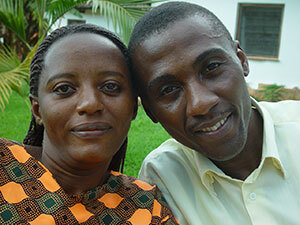 More than 200 people attend Sunday morning meetings – mostly local families and pupils boarding at the school. It’s become known just as “the church that meets at the High School”. The church has home groups which meet during the week. It has also run Alpha Courses for villagers. There is also a women’s fellowship, a men’s fellowship and a Sunday school. A growing demand for a more dedicated building of its own for a range of community services means a move to the centre of Kabubbu to be part of a Community Centre. The pastor, Peter Babu, was appointed in April 2008. Peter is a former deputy head of the Primary school. He stepped down to concentrate on the church. In December 2011 he completed a diploma of Theology in Education at Kampala Evangelical School of Theology. The other elders are the Executive Director of the KDP, Enoch Kagoda and his wife Lillian, and Ben Misindye – head of the Trust High School. Christianity is the most widely-held faith in Kabubbu. Among the other churches nearby are a Pentecostal, a Catholic, a Church of Uganda and a Seventh Day Adventist. Quicken and the elders at the church at the Trust High School have been keen to maintain good relations with all of them and Quicken personnel organise events for Churches Together. There are also a number of Muslim families who attend the local mosque. Teaching through the church is vital to provide truth and dispel myths and superstitions which maintain a hold on a rural community. The local witchdoctor still exerts an unhealthy influence, offering charms and spreading nonsense such as the idea that AIDS can be cured if the sufferer sleeps with a virgin. There is a hunger in Kabubbu to hear about Jesus. Quicken Trust doesn’t take evangelists there, but encourages consistent outreach to the community. 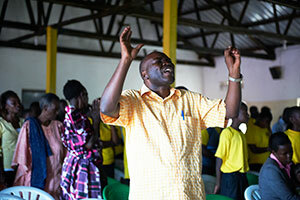 Uganda has plenty of evangelists who can speak the local languages and are more culturally relevant.